The World of Playing Cards is a living encyclopaedia of the history and visual art of playing cards. Our mission is to make a contribution to the public awareness and appreciation of this fascinating and ancient subject that encompasses so much of social involvement, play, history and art. Founded in 1996, the website is regularly updated. Site updates are available via the archives page, the RSS feed, Twitter and Facebook. Simon Wintle is the curator of the World of Playing Cards and The English Playing Card Society websites. Simon has lived at various times in Chile, Spain and England, and currently lives in North Wales. 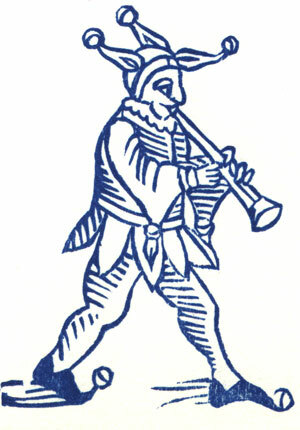 Simon's first limited edition pack of playing cards was a replica of a seventeenth century traditional English pack, which he produced from woodblocks and stencils. Simon's son Adam has also been involved developing the site. 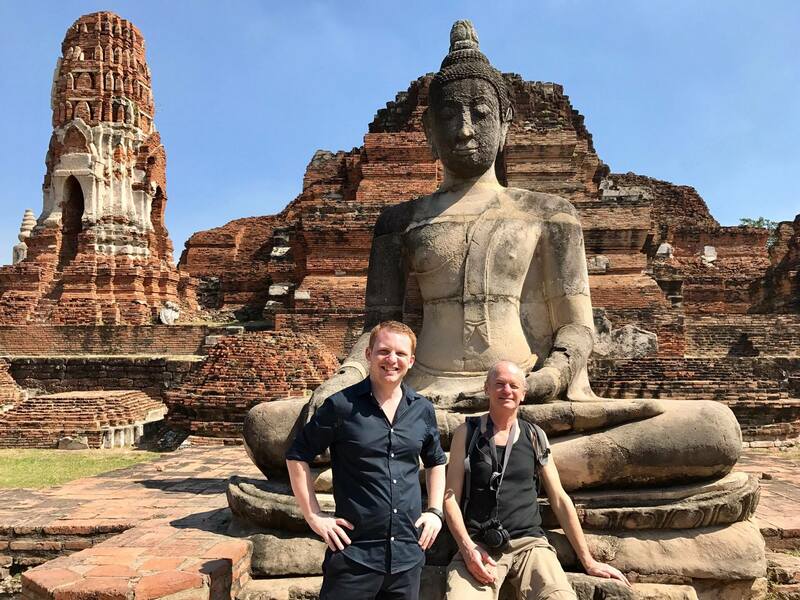 Simon Wintle (right) with Adam Wintle (left) visiting Ayutthaya in Thailand, 2016. This site was designed to be a classroom companion. Included within the site we hope you'll find ideas for classroom projects, lectures, project handouts and more to use for teaching. If there's something specific you're looking for to use in the classroom and you can't find it on the website, please get in touch using the subject Teachers and Classrooms and we might be able to help. View our full bibliography page for works on playing card history and design which have been consulted in preparing this website. Other sources are referenced in the footnotes. Thanks are due to the following individuals who have contributed articles or images of cards from their collections: Peter Mark Adams, Amit Benyovits, Francis Bevers, John Bevin, Erik Blåsjö, Albinas Borisevičius, Peter Bowie, Sallie Boyd, Steve Campbell, Michael Curtis, John Daniels, Neil Darbyshire, Frederic C. Detwiller, Emma Donovan, Marc Dorst, Dan Dragojevich, Alison Dunne, Camelia Elias, Peter Endebrock, David Epps, Alan Ferg, Steve Ferguson, Lauren Forestell, John Gallagher, Enrique García Martín, Tony Gibbs-Murray, Richard Giorgio, Steven & Marsha Goldblatt, Mike Goodall, Richard Green, Andy Grigg, Tony Hall, Ib Hedegaard, Hans Hinrup, Mike Jacobs, Saskia Jansen, K. Frank Jensen, Linda Johnson, Siobhan Johnson, Dalu Jones, David C. Kelzenberg, Jukka Kettunen, Valentin Krasavin, Alex Lamont, Robert S. Lancaster, Pavel Langer, Anthony Lee, John Lillyquist, Ken Lodge, Maria Marcet, Cheryl McDonagh, Kody McGregor, Tracy Moffatt, Mike J. Morrissey, Joop Muller, José Manuel Murcia, Larry and Tammy Northup, Dudley Ollis, Cunie Out, José Luiz Pagliari, Daria Luisa Patanè, Diego Peña, Juan José Pérez-Castejón, Alberto Pérez González, Joseph Pierson, Rex Pitts, Matt Probert, Jay Recher, Kathey Renault, Elizabeth Richmond, Ruud Ruitenberg, Juan José Ruiz, Peter Scarlett, Klaus-Jürgen Schultz, Martin Shaw, John Sings, Rod Starling, Paul Symons, Jean Szawiola, Nick Thomas, Barney Townshend, Mike & Daf Tregear, Maria Alessandra Umiltà, Luz Ángela Vargas, Pat Waddington, Jan Walls, Donald Welsh, Adam West-Watson, Samten de Wet, Becky Winter, Lotte Wintle. Also: Archivo General de la Nación (Buenos Aires), the Public Library of Cincinnati and Hamilton County, the Archaeological Service of the Municipality of Dordrecht (Netherlands), the Worshipful Company of Makers of Playing Cards Collection and the London Metropolitan Archives, City of London Corporation. Visit the downloads center for PDF downloads. The World of Playing Cards currently accepts text-link adverts placed on the homepage and in context within our articles, please contact us for more details and pricing. The World of Playing Cards is set in almost entirely set in Matthew Carter’s Georgia with uses of Sorts Mill Goudy by Barry Schwartz, Garamond by Adobe, Tisa by FontFont and Museo Slab by exlibris Font Foundry. The site is written in XHTML with Cascading Style Sheets (CSS), programmed in PHP and mySQL and hosted by Linode. Articles are published using MODX CMS in addtion to our own plug-ins. The World of Playing Cards has been optimized for the following browsers: Chrome 5+, Safari 5+, and Firefox 3.6+; if the website looks broken in your browser please contact us.